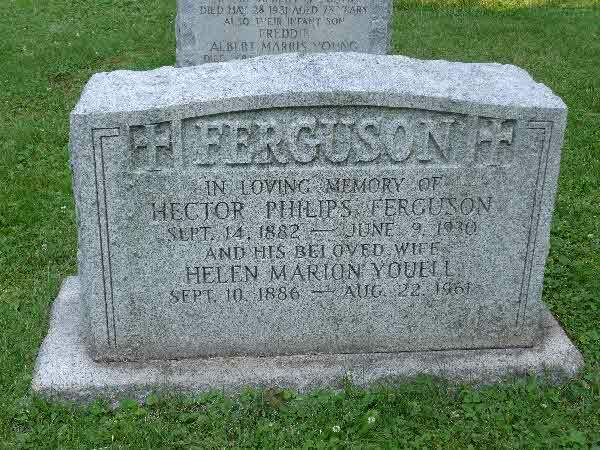 Marriage* Hector Philip Ferguson married Helen Marion Youell, daughter of George Warren Youell and Alice Jane Burwell, on 9 July 1912 in Aylmer, Elgin County, Ontario, Canada. 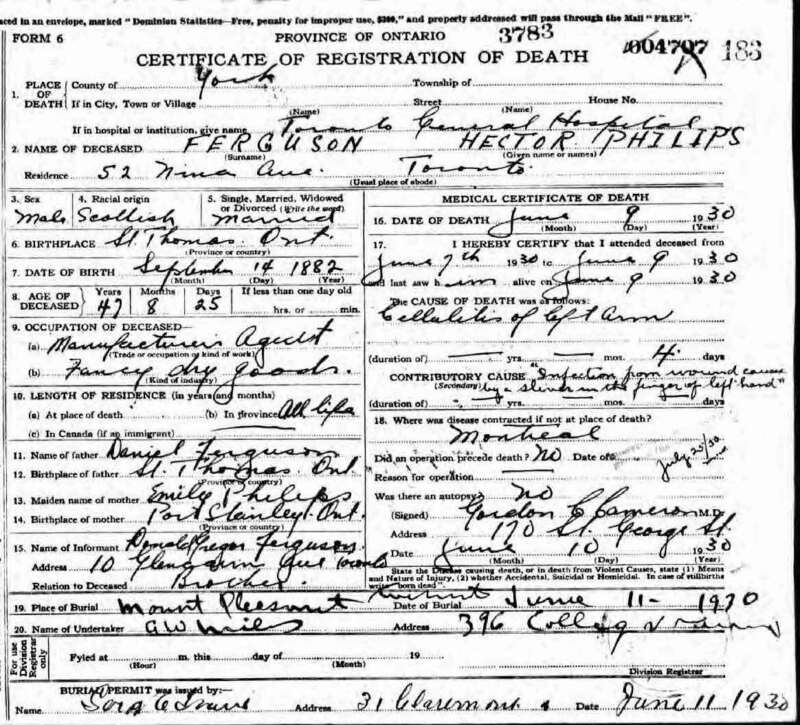 Death* He died on 9 June 1930 in Toronto General Hospital, Toronto, York County, Ontario, Canada, at age 47. 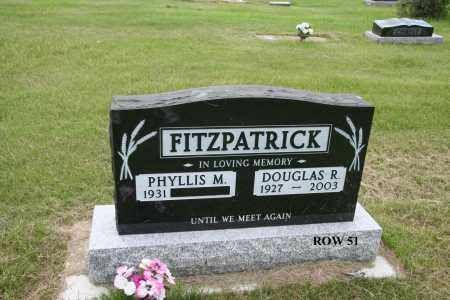 Burial* He was buried on 11 June 1930 in Mount Pleasant Cemetery, Toronto, York County, Ontario, Canada. 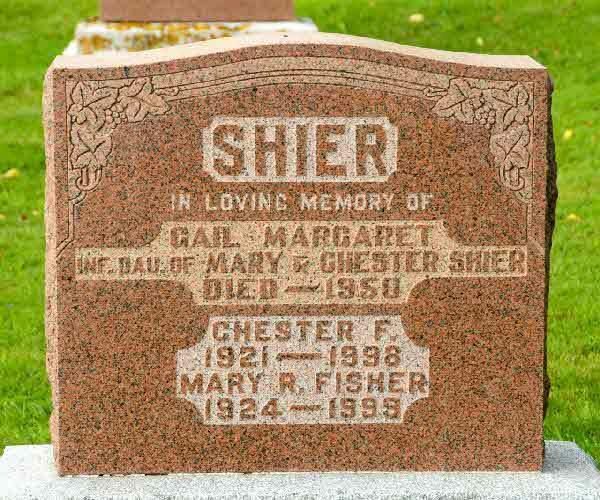 Burial* She was buried in Drumheller Cemetery, Drumheller, Strathmore Census Division, Alberta, Canada. he Mineralogical Association of Canada has lost a founding father, a pillar of the association since its inception, and an important mineralogist and crystallographer. Bob Ferguson was one of the 16 mineralogists who met at the Mines Branch on Booth St. Ottawa on Aug. 23, 1954 who set up the mechanism for the founding of the MAC in 1955. He was president of our Association in 1977, and honored with the Hawley Award in 1981. In 2013, at the age of 93, he attended the MAC luncheon at the annual GAC-MAC meeting, and produced a remarkable gift of the performance by a professional musician of a composition by Martin Peacock. Bob attended the University of Toronto from 1938 to 1947: B.Sc., 1942; M.Sc., 1943; Ph.D., 1948. His advisor was Martin Peacock, a great mineralogist and leader in X-ray crystallography. 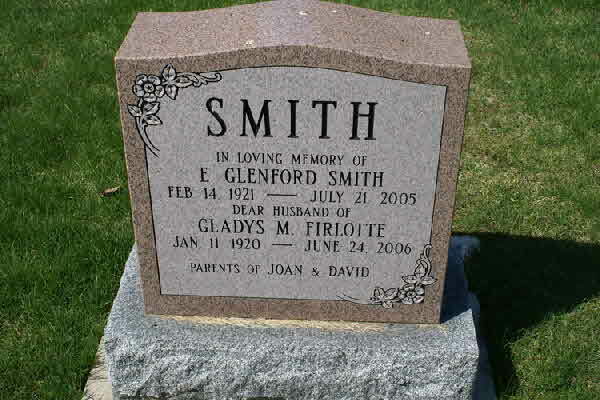 His graduate studies included the crystallography of aluminofluorite from the famous Ivigtut cryolite deposit in Greenland. The students of Professor Peacock, including Bob, spread the use of X-ray crystallography in Canada. Bob honored his mentor through the MAC, by having the Past-Presidents Medal renamed as the Peacock Medal. Bob was appointed Professor of Mineralogy at the University of Manitoba in 1947. Professor George Brownell, Head of the Geology Department, also arranged funds for the purchase of equipment for an X-ray laboratory. One of his first research projects was to determine the crystal structure of albite, with W.H. Taylor of Cambridge, and their first publication on this subject was “The crystal structures of low- and high-temperature albites” (Ferguson R.B., Trail R.J., & Taylor W.H., 1958, Acta Crystallographica, vol. 11, p. 331-348). His interpretation of the order-disorder of Si-Al in the tetrahedral sites was “vigorously attacked by the feldspar gurus of the time” (his words); this caused him great anxiety for some years; good science eventually upheld his work. He went on to produce many publications, the majority on feldspar composition and structure, Si-Al ordering, and the determination and uses of bond lengths and bond strengths in crystal structure determinations. Bob had 3 notable postdoctoral fellows viz: K.V.Subbarao, Petr ?erný, and Frank Hawthorne. Bob attracted Petr ?erný to Manitoba as a post-doctoral fellow in 1968, using the lure of the Tanco pegmatite, and Bob and Petr began a long collaboration on the minerals of Tanco that involved Joel Grice and Frank Hawthorne on Bob’s side, and a list of luminaries of pegmatology on Petr’s side. Bob’s role as a teacher and mentor has been praised by his students, with the special recognition of having a mineral named after him, bobfergusonite (a transition-metal phosphate mineral discovered in a pegmatite at Cross Lake, Manitoba). Also, several of his graduate students and post- doctoral fellows have been honored by having minerals named after them, viz. : bobtrailite, trembathite, gaitite, ?ernýite, griceite, and frankhawthorneite. Bob had a major effect on the science of crystallography in Canada; in addition to his” mineralogical children”, Bob introduced many chemists, physicists, and other disciplines, to crystallography through his teaching and collaboration. He retired in 1985 as Professor Emeritus, and was an active participant in the intellectual life of the Department for many additional years. This brief account of Bob’s life in science and education fails to record the charm, goodness of heart, charitable and community initiatives, and optimism that captured generation after generation of students and colleagues. 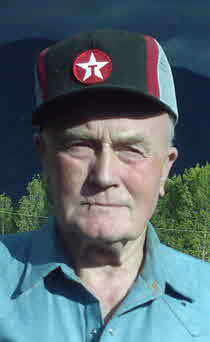 Bob was born in 1920 in Galt, Ontario. 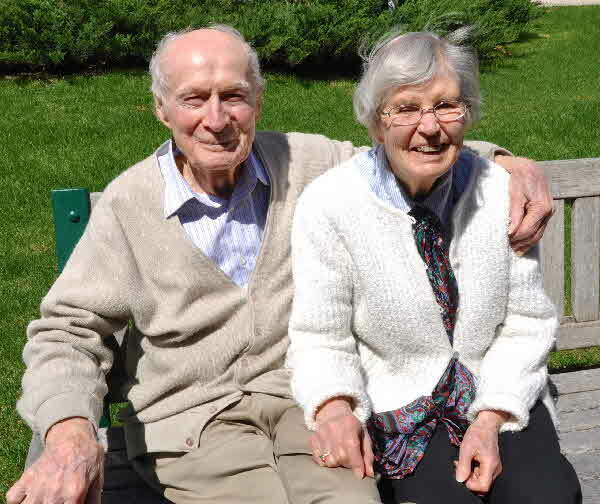 He married Margaret Warren in 1947; many of our members have met her and would like her and family to know that the memory of this kind, helpful, gentleman and scholar will not be lost in the memory of the Mineralogical Association of Canada. Allan Turnock, Dept. Geological Sciences, University of Manitoba, Winnipeg, Canada. 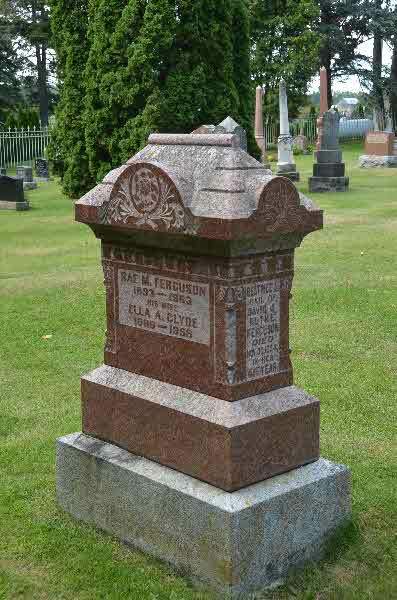 Burial* He was buried in Hamilton Cemetery, Hamilton, Ontario, Canada. 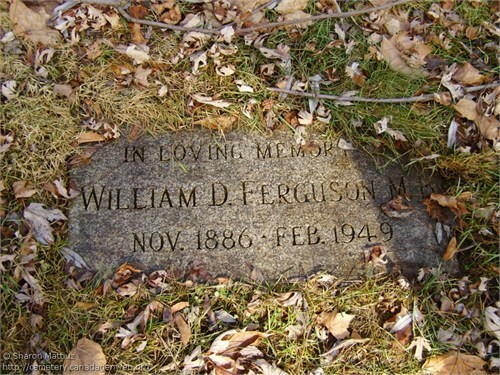 [S31] Canada, Genweb Cemetery Index, online \, Death Index for William D. Ferguson. 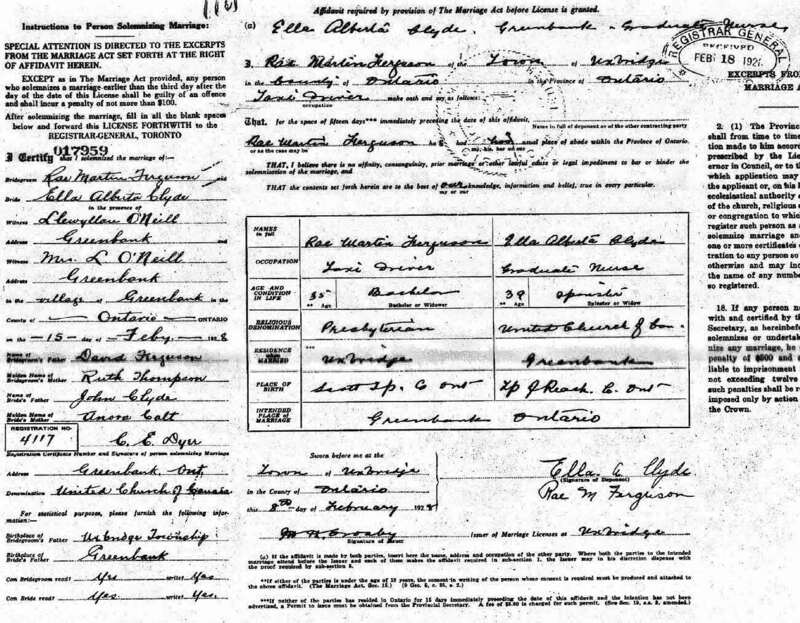 Marriage* Rae Martin Fergusson married Ella Alberta Clyde, daughter of John Clyde and Honora Calt, on 15 February 1928 in Greenbank, Ontario County, Ontario, Canada. 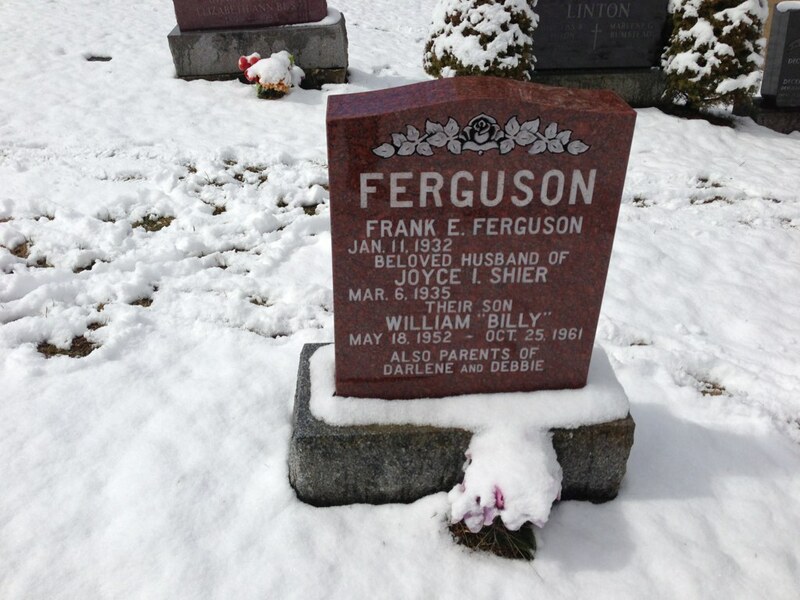 Death* Rae Martin Fergusson died in 1963 in Foster Memorial Cemetery, Scott Twp., Ontario County, Ontario, Canada. 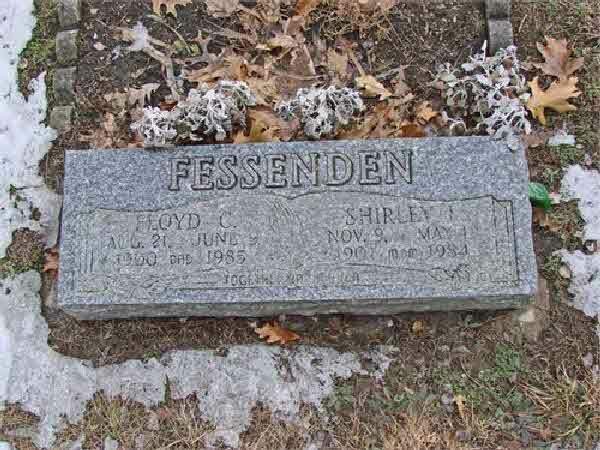 Burial* She was buried in Marne Cemetery, Marne, Kent County, Michigan, United States. 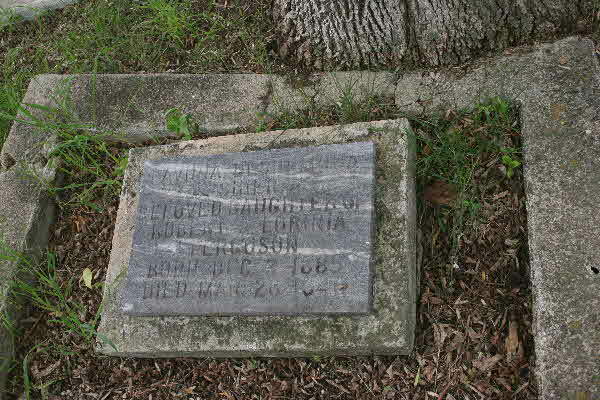 Death* Ethel Josephine Fingleton died on 25 December 1978. [S91] Manitoba, Canada, Birth Index 1870 - 1917, online \, Birth of Kathrin Ann Finlayson, daugher of Maria Shier. 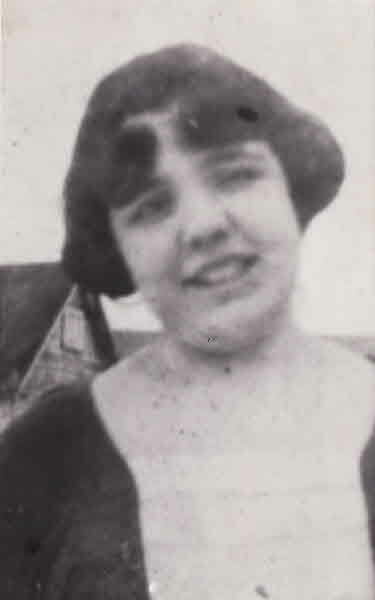 [S1] Ancestry.ca, online \Ancestry.ca\, Martha Maud Finleyson in the Family Data Collection-Individual Records. Hereinafter cited as Ancestry.ca. 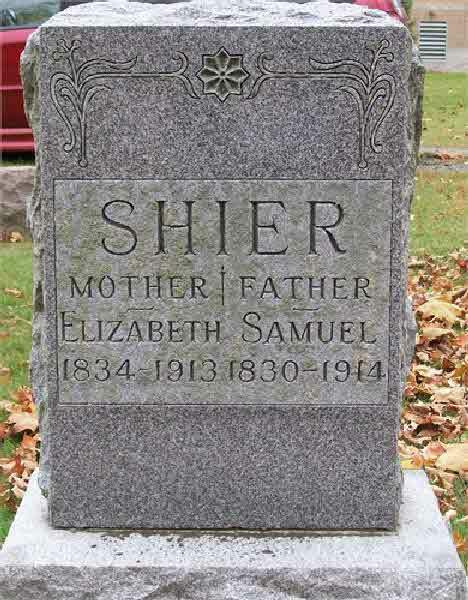 Burial* She was buried in Sandford Cemetery, Scott Twp., Sandford, Ontario County, Ontario, Canada. 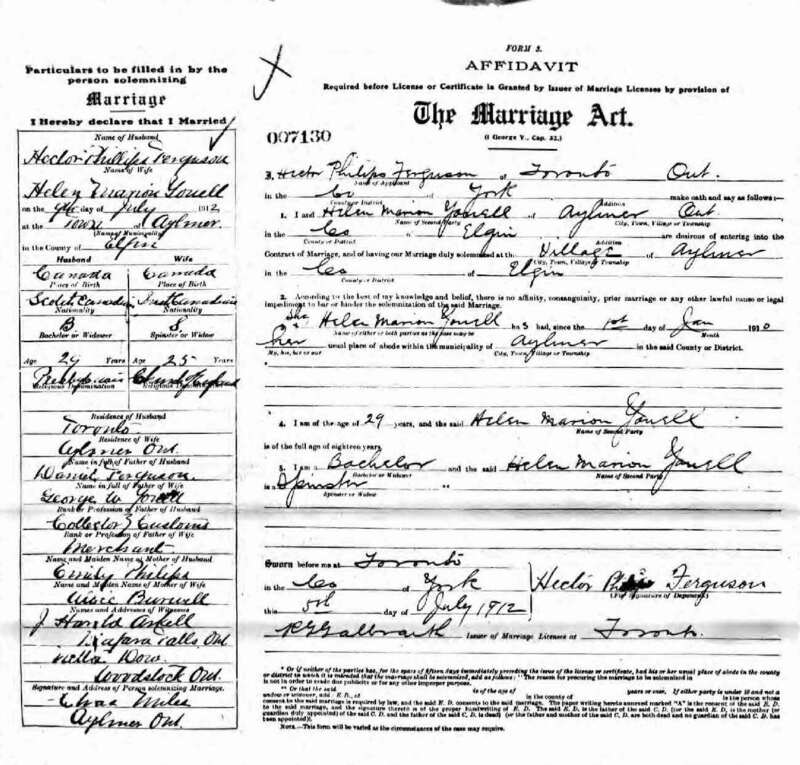 Marriage* Robert Fitzgerald married Anna Maria Shier, daughter of Joseph Shier and Catherine Corneille, on 31 October 1883 in Parish of Shanagolden, County Limerick, Munster, Ireland. [S1] Ancestry.ca, online \Ancestry.ca\, Gronley family Tree by 1koolkandy2. Hereinafter cited as Ancestry.ca.